During every full moon, at a usually busy beach, a group of ghostly figures congregate on the shore during the night. They’re at Snapper Rocks on the Gold Coast for a unique experience – to ride the surf as it glows under the light of the moon, for surreal waves without the masses of daytime crowds. One of the dedicated riders, Luis Mori, 42, told Daily Mail Australia about taking photographs of those who get up to start catching the moonlit waves at about 3am in the morning. 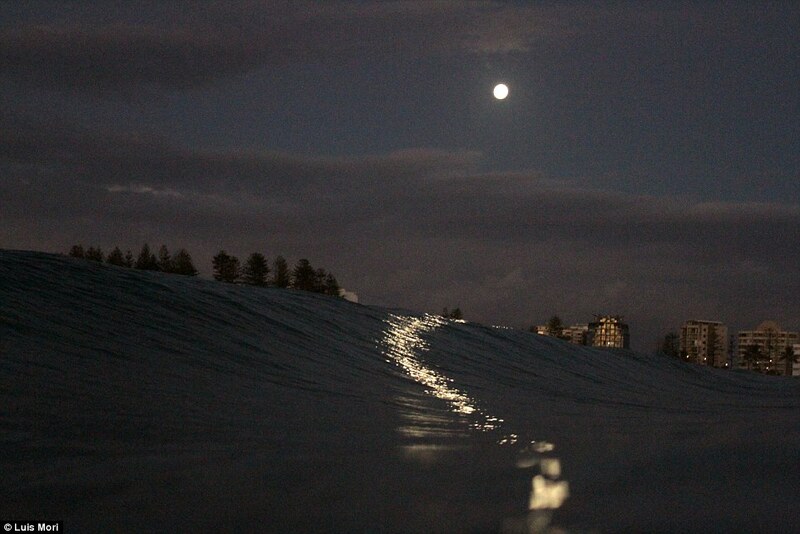 ‘When there’s a full moon, or nearly full moon, there’s usually about 50 people coming here (Snapper Rocks). They wait for the moon to be in the perfect position so it can shine on the face of the waves and light up the waves so they can ride them,’ he said. What lies beneath? Sharks. That’s what. And right now, the experience is even more intense, as Queensland is being hit by large waves caused by ex-Tropical Cyclone Winston, which Mr Mori says is making for the biggest swell in a year. 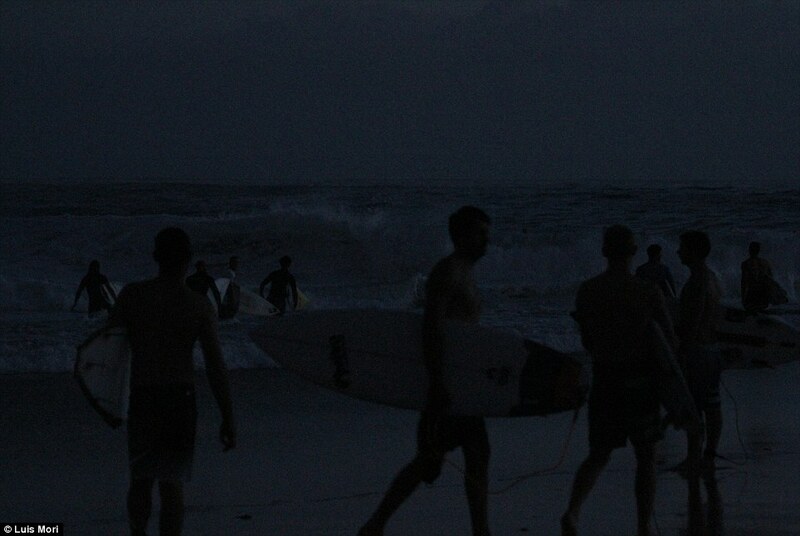 The experience of surfing a wave at night was ‘incredible’. ‘It’s something spiritual, at first you can’t believe how clear it is with the light the moon can create. It’s amazing. It’s just for you’. Those making the most of the moon only have a small window of time to do so – usually the night of full moon and the one before and after. The night riders are gone when the day breaks at about 5-6am, Mr Mori, originally from Peru, says. Riding the moonlit waves also comes with the benefits of dodging the crowds. At the same beach, by 6am, there could be up to 400 people in the line-up for a wave, Mr Mori said. As for any concerns about sharks in the water, he said it was too dark to see them, even if they were there. Surf in the shadows where it’s safe. ‘A real Aussie guy who is born and bred in Australia, they don’t care, they just jump in the water and surf,’ Mr Mori, who is also a lifeguard, said. Forecasters have warned of abnormally high tides and dangerous surf as ex-Tropical Cyclone Winston hits the Queensland coast this weekend. The Bureau of Meteorology has issued a severe weather warning which covers the coast from Fraser Island to New South Wales. Due to the conditions, some of the Gold Coast’s beaches were closed as early as Friday, Weatherzone reported. Gold Coast City acting chief lifeguard Chris Maynard said five of the region’s 41 beaches had been closed. He predicted that with intensifying conditions, many more beaches could be closed by Saturday. Ex-Tropical Cyclone Winston is expected to start weakening on Sunday. Surf Life Saving Australia has recommended people avoid the water and surf-exposed areas.